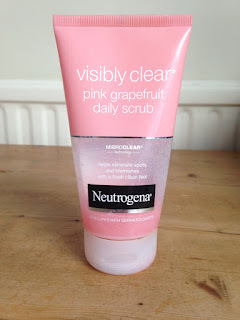 My favourite face scrub has to be Neutrogena Visibly Clear Pink Grapefruit Daily Scrub, it is awesome and I always go back to this one. I have branched out over the years and tried other brands but I haven't found any that compare to this one. It is a refreshing scrub and I use it every morning. It is apart of my daily skin care routine and my skin feels rejuvenated afterwards. When trying other scrubs I have sometimes had a break out but with this one I did not. The pink grapefruit scent is part of what I love so much about it and adds to the refreshing feeling. :) There are pigments in the scrub that helps keep away impurities and exfoliates the skin. It is currently reduced at Boots and only cost £3.30, which is a bargain.